It’s tournament time for our Penn soccer teams! 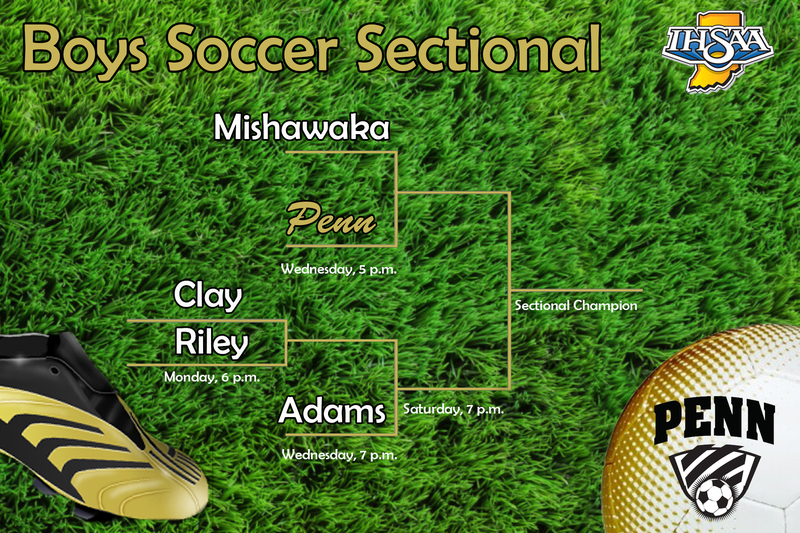 The sectional pairings have recently been released for the sectional that Penn will host, and Penn’s undefeated Northern Indiana Conference champion boys soccer team matches up against bitter rival Mishawaka, on Wednesday, October 5th at 5 p.m. If Penn advances, the Kingsmen will advance to Saturday’s championship, which is set for 7 p.m.
Sectional action starts on Monday at 6 p.m. when Riley plays Clay. Penn opens action at 5 p.m. on Wednesday, followed by the match between Adams and the Riley-Clay winner at 7 p.m. The winner of the Penn sectional will play the winner of the Plymouth bracket in the regional, which includes Warsaw, Culver Academy, Wawasee, NorthWood, and Plymouth. Boys sectional action will be hosted at 64 sites, 32 in each class, and will be played from October 3-8. Currently, the Penn boys soccer team boasts a streak of five straight sectional championships, dating back to 2011. They have just completed an undefeated, NIC championship-winning season, and are hoping to make a state-title run. Last season, the Kingsmen reached the Final Four.